Get all of Al-ittihad FC (Jeddah) latest football results for every football game they have played. 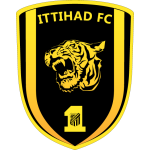 See how Al-ittihad FC (Jeddah) has gotten on in the 2019 league tables, cup competitions and friendly games including the Pro League, Super Cup, King Cup, AFC Champions League & Arab Club Champions Cup football tournaments. Get every football score, football fixture and football stats for Al-ittihad FC (Jeddah) in the 2019 football season only at ScoresPro - the #1 Football livescore website for Al-ittihad FC (Jeddah)! Get the latest Al-ittihad FC (Jeddah) football scores and all of the Al-ittihad FC (Jeddah) stats for all Pro League, Super Cup, King Cup, AFC Champions League & Arab Club Champions Cup games in the 2019 season only at ScoresPro, the #1 football & soccer livescore website for Al-ittihad FC (Jeddah) football!